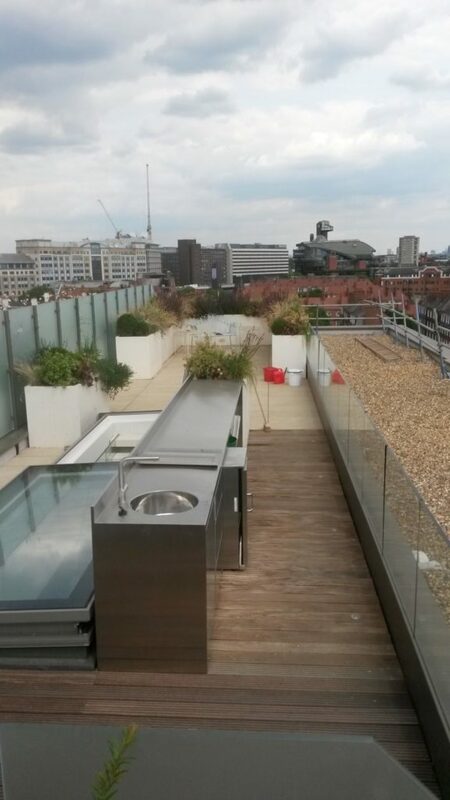 We were initially invited to a briefing by the project team for luxury developers Mount Anvil in April 2016 with a view to designing and building four stainless steel outdoor kitchens for the penthouse flats at the top of their new Queens Wharf development. 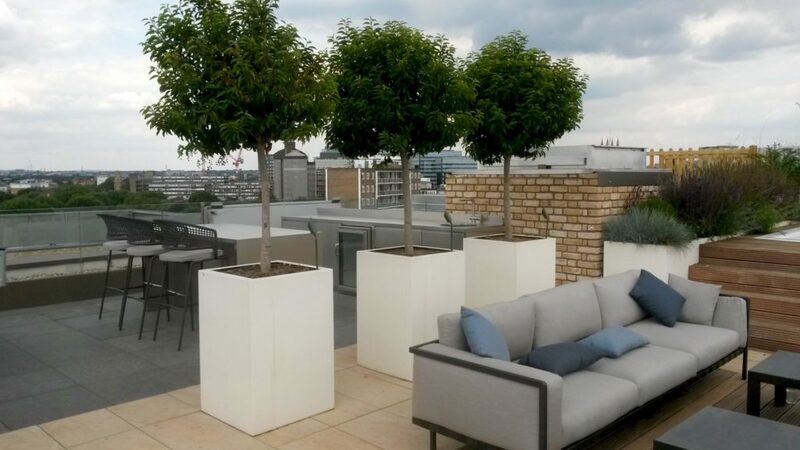 The building, on the site of the old Riverside Studios overlooking London’s Hammersmith Bridge, would incorporate new studios and a development of luxury flats above, four of which would have rooftop gardens with views over the river. 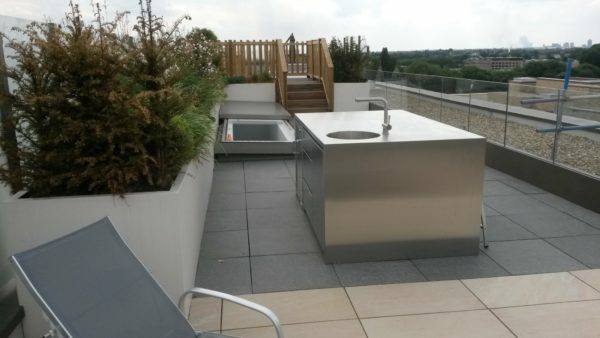 Over the following year while the building progressed, we developed ideas and CAD proposals for the kitchens and by the time the building had reached its final stages at the end of 2017, we were ready to proceed to manufacture and installation with agreed shop drawings produced by our fabrication partners Cavendish Equipment who specialise in the design and manufacture of stainless steel kitchens for both domestic and commercial clients. 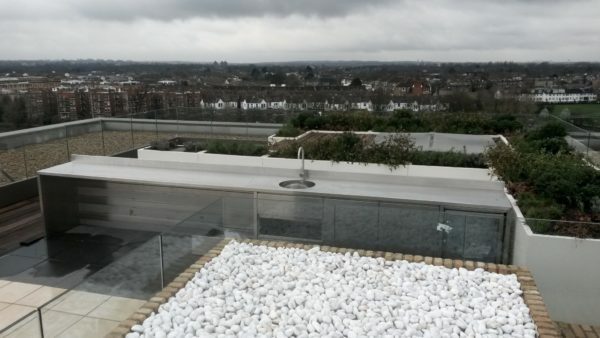 Installation started in appalling weather conditions over the 2017/18 new year and thankfully by March 2018 and the beginning of better weather, we were ready to hand over the four stainless steel outdoor kitchens to their new owners. 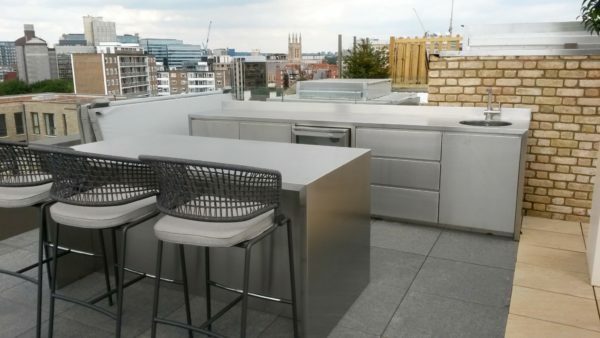 Featuring Franke ‘Atlas’ taps on all the bars and because of budgetary limitations placed on us, Beefeater outdoor fridges and warming drawers were specified against our initial spec for Sub Zero/ Wolf or Blastcool appliances. 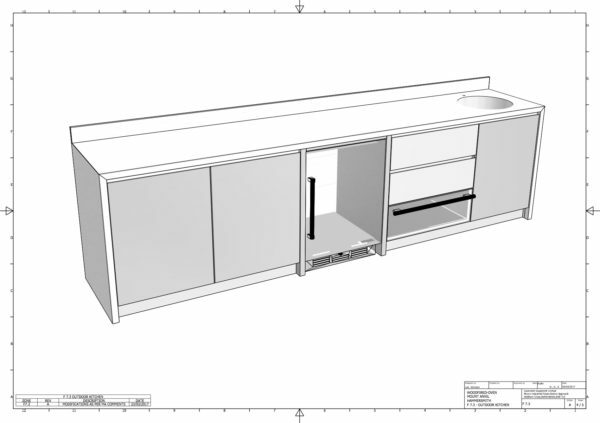 Following the successful collaboration between us and Cavendish, we can now offer a full turnkey service to our clients, from initial design brief to implementation and after sales maintenance. We can more or less design and manufacture anything in stainless steel, subject to the limitations and challenges of materials handling and sheet size. 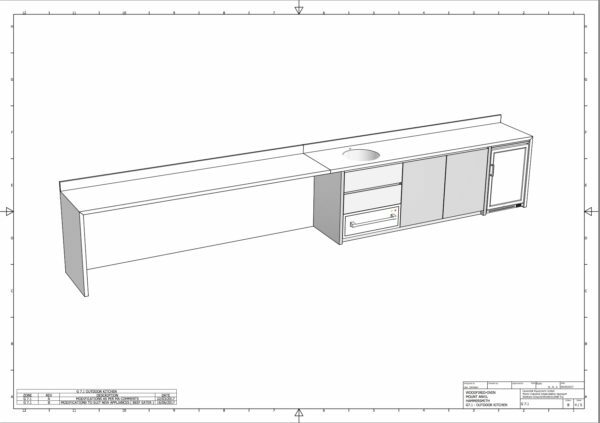 The shop drawing illustrated shows a necessary joint half way across the bar length which now has a support bar installed to buttress any potential sagging that might occur over such a long length.